A 200-pound black bear, who wandered up into a tree at the University of Colorado – Boulder, is again safe after wildlife department officials managed to get him out of a sticky situation. The male bear was seen ambling around a residence hall area before he attempted to scale a tree. The wildlife officers tranquilized the bear while he was up in the branches and, after a short wait, the bear safely landed on his back. The bear had spent the better part of the day on campus, students said, and climbed about 15 feet into a tree near the University of Colorado’s Williams Village dormitories. Wildlife officials shot two darts into the bear around 10am as curious students looked on, the Denver Post reported. CU Police Department Spokesman Ryan Huff told the paper that they chose to sedate him because of his close proximity to students and the potential danger that held. “He was just resting up in the tree probably for a good two hours,” Ryan Huff told thedenverchannel.com. In preparation for the beast’s tumble, wildlife officials set up a large black mat under the tree. Photos and video capture the bear freefalling 15 feet and onto the mats. His paws were comically outstretched as he fell through the air. 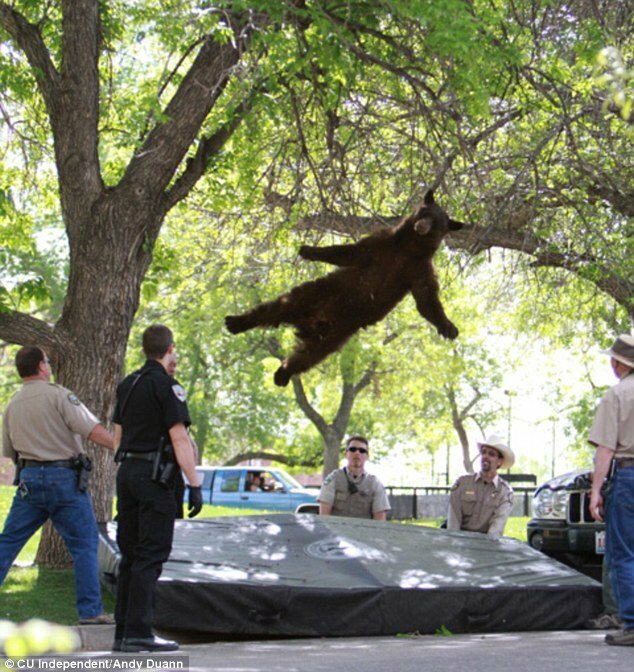 Andy Dunn of cuindependent.com captured a delightfully surreal image of the bear tumbling from the tree, surrounded by vigilant campus police and wildlife officials. For a few minutes, the bear was allowed to rest on the mat and looked dazed, if not comfortable. Students looked on and captured the bizarre moment with their smart phones and cameras. Workers then moved the creature into a large cage around 10:45 a.m. Some students were brave enough to stick their fingers through the cage and stroke the tranquilized bear’s foot. Jennifer Churchill, a spokesperson for Colorado Parks and Wildlife, told the Post that the woozy bear was tagged and released in the mountains west of Boulder. She added that black bears often come out of hibernation around this time, and come looking to more populated areas for food.